Seeing that the post on the highway speed limit was quite hot, let’s have a look at the German Autobahn. The Autobahns are a series of highways in Germany, though there are some Autobahn-class highways in other countries too, like Austria and Switzerland. The highways are labelled with the capital letter A, followed by a two digit number. Autobahn construction began in the early 1920s, and the first section opened in 1935, stretching from Frankfurt Main to Darmstadt. Early Autobahns were used for breaking speed records. Shows how good the quality is. Heh. Germany’s Autobahn network today spans a length of 11,980 km in total. 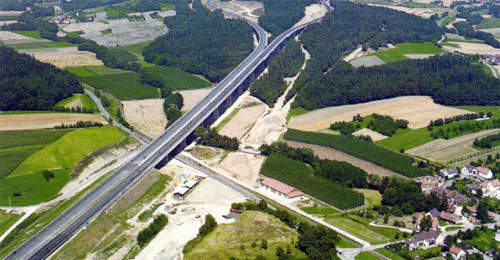 Modern Autobahns have 3 lanes and 1 emergency lane. Different sections of the Autobahn have different speed limits. Some sections have no speed limit. These sections with no speed limit account for about half of the overall Autobahn stretches. On the sections with no speed limit, it is only applicable to most vehicles except for buses which have a 60km/h speed limit, vehicles with total weight of 3.5 tonnes, most vehicles pulling trailers, and empty buses which have a 80km/h speed limit, and 100 km/h for cars and buses pulling trailers certified for that speed limit. Everything else does not have a speed limit, though it is recommended you travel at 130km/h. Autobahns also have a minimum speed of 60km/h. If your vehicle is not capable of reaching this speed, it is not allowed to go onto the Autobahn. Because of the Autobahn, most continental car manufacturers have a gentleman’s agreement of limiting the car’s top speed electronically to 250km/h for safety reasons.